The growling grass frog is one of Australia’s largest frog species. It likes to live amongst reeds, sedges and rushes growing in and along slow moving streams, ponds, lakes and farm dams. (Photo by Geoff Heard). How do we choose among conservation options when resources are scarce and there is uncertainty regarding the effectiveness of actions? It’s the core challenge of good environmental decision making and its dimensions make more sense when applied to a specific situation. 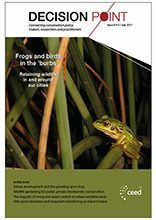 In this case we wanted to explore what actions would give the endangered growling grass frog (Litoria raniformis) a better chance of persisting in the developing urban zone around Melbourne. We tackled this by linking population viability analysis (PVA) with a cost-effectiveness analysis (CEA) (Rose et al, 2016). While this is an approach that has been used in other places, we found that no one had adequately accounted for uncertainty in such an integration. Well-developed tools exist for prioritising areas for one-time, binary actions such as making a plot of land a protected area (or not), but methods for prioritising incremental or ongoing actions (such as creating or maintaining habitat) remain uncommon. We devised an approach that combines metapopulation viability and cost-effectiveness analyses to select among alternative conservation actions while accounting for uncertainty. The most satisfying outcome from this work is that it has had a real influence on the decisions made by key decision-makers involved in the case study. In our study, cost-effectiveness is the ratio between the benefit of an action and its economic cost, where benefit is the change in metapopulation viability. And the metapopulation we were interested in was of the endangered growling grass frog, which is threatened by urban development. The area we focused on was zoned for urbanization in the rural north of Melbourne. We extended this analysis by using a Bayesian model to predict metapopulation viability under nine urbanization and management scenarios and incorporated the full probability distribution of possible outcomes for each scenario into the cost-effectiveness analysis. This allowed us to discern between cost-effective alternatives that were robust to uncertainty and those with a relatively high risk of failure. We found a relatively high risk of extinction following urbanization if the only action was reservation of core habitat (which is often the only thing that happens in these situations). Actions that foster the creation of habitat performed better than enhancement actions; and cost-effectiveness ranking changed depending on the consideration of uncertainty. 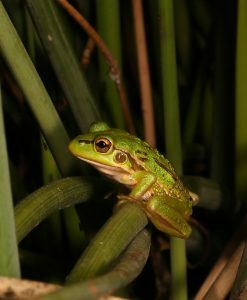 Our results suggest that the creation and maintenance of wetlands dedicated to the growling grass frog is the only cost-effective action likely to result in a sufficiently low risk of extinction in this case. To our knowledge we are the first study to use Bayesian metapopulation viability analysis to explicitly incorporate parametric and demographic uncertainty into a cost-effective evaluation of conservation actions. The approach offers guidance to decision makers aiming to achieve cost-effective conservation under uncertainty. The most satisfying outcome from this work is that it has had a real influence on the decisions made by key decision-makers involved in the case study. Both Melbourne Water and the Victorian Government have read the work and contacted me on advice about how to modify plans in the area so that our findings are taken into account. This gives the growling grass frog a far greater chance of hanging in there. It also highlights the importance of strengthening networks and sharing knowledge between practitioners, government and academia. In addition to making the findings public through the traditional peer-reviewed publishing process, direct communication with Melbourne Water at the beginning and end of the study (through discussions and a presentation) drove changes in decision-making.